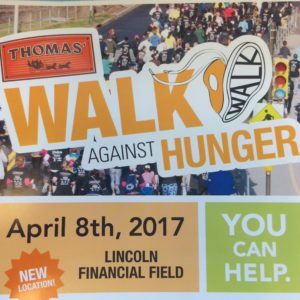 The Thomas' Walk Against Hunger relies on donations from dedicated individuals, businesses and organizations. Please donate or fundraise what you can! ElderNet's Ada Mutch Community Resource Center benefits from this walk. In 2016 we helped more people than ever before and are in need of your support! Help us make a difference in 2017!! Free Parking is available at the stadium, and there will be a free shuttle from the Broad St. Line subway stop. Those interested in taking SEPTA, you can take regional rail into Suburban Station and then walk and transfer to the Broad Street Line. It's either a token ($1.55) or $2.25 cash each way. The walk is Saturday April 8th, registration begins at 8:30 AM and the event ends around 11 AM. 2. Click on "click here to get started"
4. Leave the page title as ElderNet of Lower Merion and Narberth to be a part of our team. If you do not want to walk, but you want to donate and/or are interested in spreading the word about donating, click HERE! The funds are shared with the entire Coalition Against Hunger and ElderNet will receive a minimum of 80% of all funds raised on our behalf. The more we raise the higher the percentage!